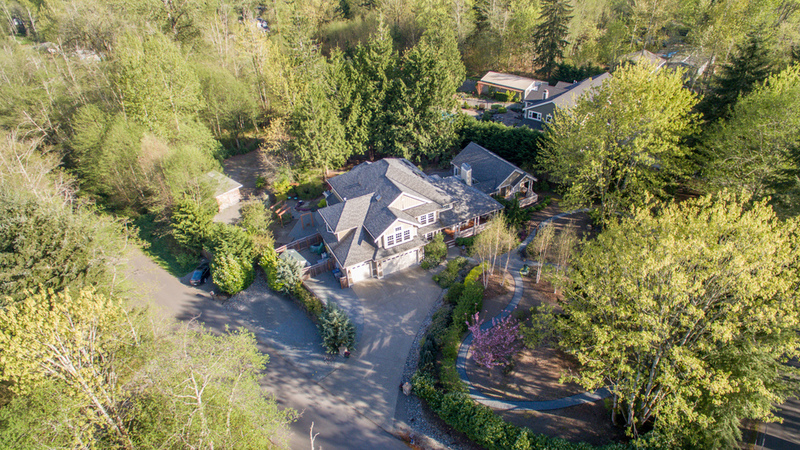 26013 NE 45th St represents the Northwest lifestyle at its best – tranquility and light set amidst the horse farms of the Redmond hills within easy reach of the Eastside tech corridor and all that the urban hubs of Seattle and Bellevue have to offer. The home is a masterpiece of refined regional design surrounded by almost two acres of exquisite native landscaping. With four upstairs bedrooms, a circular floor plan and a gorgeous guesthouse, this is the perfect retreat for those seeking casual opulence surrounded by absolute tranquility. The house references both Craftsman and farmhouse details on its exterior with a wide wraparound porch that connects the main residence to the guesthouse and includes plenty of deck space for casual outdoor relaxation and entertaining. A grand, two-story entrance opens into a more formally designed main level, with architectural details that include arched passageways, elegant columns and intricately detailed millwork and wainscoting. The floor plan invites easy circulation and affords a light-filled and airy sensibility through oversized windows and French doors. This is the ideal layout for the Northwest lifestyle – spacious in volume, yet intimate in its individual living areas, offering rich materials and surfaces that include natural stone, hardwoods and custom built-ins and cabinets. A LIVING ROOM lies directly off of the entryway, and provides an elegantly detailed sitting area built around a gas fireplace with custom mantle. This room passes through a columned passageway into the formal DINING ROOM with a coffered ceiling and accent lighting. The room looks over the back yard and circles through to the kitchen. To the left of the entry is a wide hall that leads past the home office and through an archway that leads to the heart of the house – a large, yet intimate and enveloping sunken FAMILY AREA that also opens onto the kitchen. It includes a natural stone gas fireplace built into a wall of custom cherry cabinets and bookcases with a deep display area on top, and conveys a classic, lodge-like sense. The HOME OFFICE is a private enclave, just off the entry, that provides a peaceful and spacious workspace with engaging views over the front gardens and a wall of custom bookshelves. It has easy access to a large POWDER ROOM with a vintage-style vanity, and is close to the fully outfitted LAUNDRY ROOM with top-of-the-line appliances and cherry upper and lower cabinets. The GOURMET KITCHEN includes a full complement of custom cherry cabinets with slab granite counters and top-of-the-line GE Monogram appliances in stainless. It is beautifully situated to provide brilliant morning light, and opens into a large casual dining area in its own bay window that is perfect for sun-soaked breakfasts and informal meals. • Sink looks over the yard via large windows that flood the room with light. The kitchen opens onto the recently added SCREENED PORCH, a wonderful enclosed area that leads to the backyard and allows for year-round enjoyment of all the property’s beautiful landscaping. It also includes three skylights. All areas are accessed off of a wide central hallway that leads directly from the graceful, multi-tiered staircase that is edged by custom wrought iron railings and culminates in a dramatic balcony-style landing lit by a large skylight. A double door entrance opens into a huge MASTER SUITE with a unique pentagonal ceiling that is flooded with light and includes a charming SITTING AREA with lovely views over the back gardens, paths and water features. This is an opulently appointed retreat from the rest of the home, occupying its own private wing of the house, and offering every imaginable convenience and luxury, including a spacious walk-in closet with a custom organization system. The ensuite MASTER BATH offers a luxurious and spa-like experience with natural stone and tile surfaces throughout, a deep corner soaking tub with views over the fountain and guesthouse, custom cherry cabinets, a two-person, walk-in shower and separate lavatory room with linen closet. Heated floors, designer Kohler fixtures and a dedicated makeup area complete this sumptuous room, with two skylights for natural light in all seasons. Two spacious AUXILLARY BEDROOMS share a nicely appointed full bath, while a GUEST SUITE with full ensuite bath overlooks the front of the house. 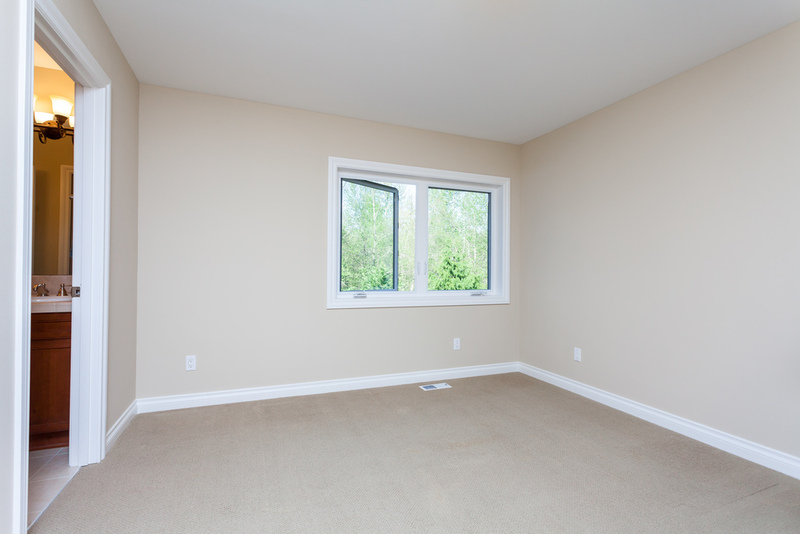 A large bonus room is accessible through elegant double doors, with a vaulted ceiling and wall of windows, and is ideal for use as a home gym, library or study. All additional baths are finished in stone and tile surfaces to match those of the master, imbuing the upstairs with a nice sense of continuity and quality. The house conveys a modern Craftsman sensibility with honest, native materials that include rough-sawn cedar and natural stone on the exterior, maple floors intricate woodwork and cherry casework within. Large, windows, many with transoms welcome sunlight at all hours of the day and frame stunning views of the surrounding gardens. A series of covered porches wraps around the house and gently guides people in. • Wide plank maple floors through the entry, kitchen, office and laundry room. • Custom wrought iron lighting fixtures in all public areas. Absolutely opulent and delightful GUEST COTTAGE is a highlight of the property and is attached by the wonderful array of covered porches and decks that surround the house. It provides a spacious and autonomous second home on the property for guests or extended family and is perfect for multi-generational households or for those in need of on-site staff. The unit feels vast, with a great sense of airiness and volume provided by an open floor plan and vaulted ceilings with recessed lighting and tons of natural light through walls of transom windows. A large LIVING AREA has space for relaxation and dining and opens to a beautifully appointed KITCHEN with full-size fridge, slab stone counters and maple cabinets with sandstone mosaic backsplash, while a three-sided gas fireplace divides the living and sleeping areas and offers warmth and atmosphere. The spacious SLEEPING AREA opens to an ENSUITE BATH in natural stone with a large walk-in shower that includes a handy built-in seat. A series of paved and gravel paths wends its way about the nearly 2 acre property, stopping off at gardens both formal and informal and at a naturalistic waterfall with its own seating area. 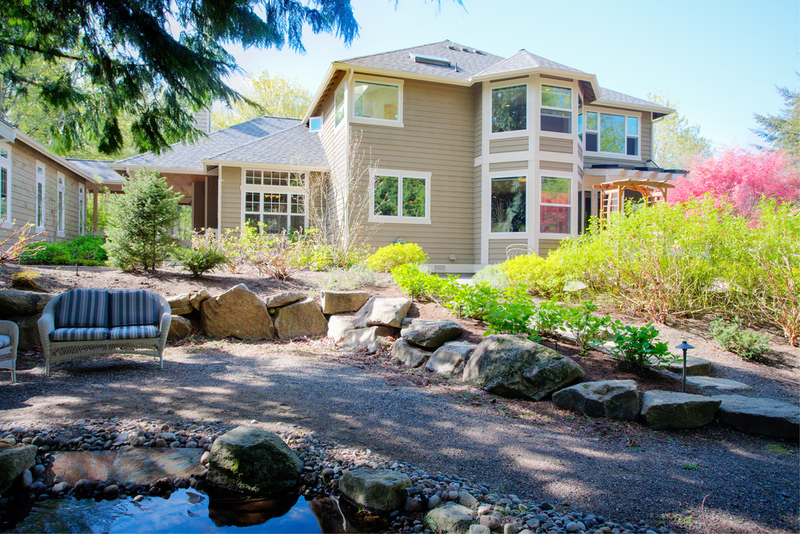 Gorgeous mature specimen trees include Japanese Maples, Magnolias and Dogwoods, and are carefully integrated with the property’s native cedars and firs to provide dappled light and sheltering shade without disrupting the home’s great siting for natural light. 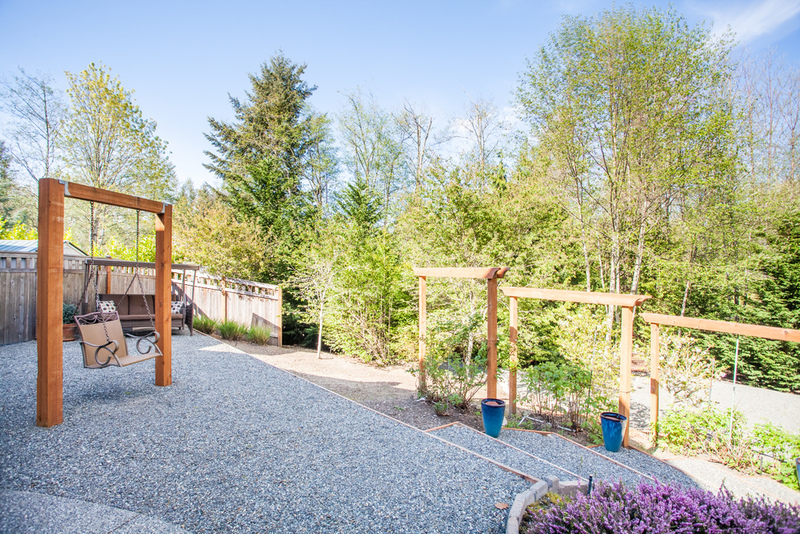 A large wooden RV storage area out back is perfect for conversion into an art studio or private retreat, while a fully finished 3 car garage with high ceilings is currently divided to allow for a studio space with storage and all mechanical systems. This singular home’s fabulous hilltop location allows for year-round light in spite of its forested surroundings, and invites its owners to enjoy the quiet of an almost rural environment in which the relaxing sounds of passing horses are as common as traffic noise in other areas. 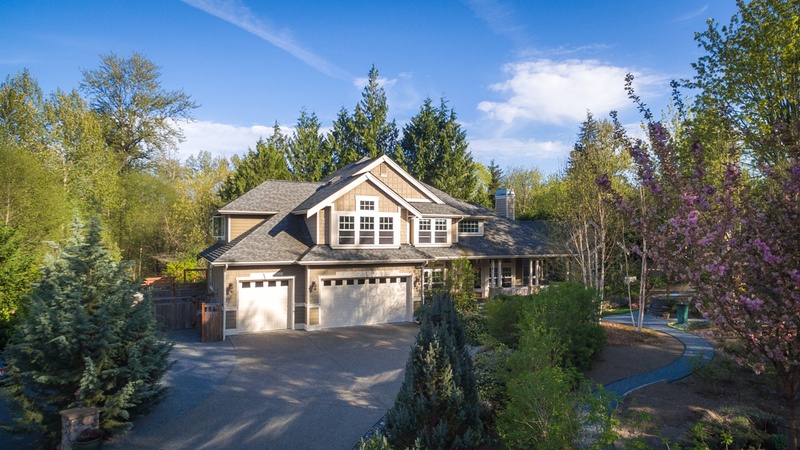 This is the Northwest ideal – unmatched naturalism, tranquility and native beauty that is just minutes to the Eastside tech corridor, and a direct drive into Bellevue and Seattle.